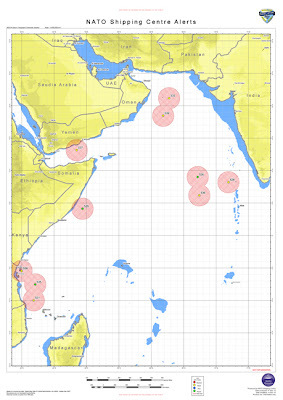 Somali Pirate Activity Areas 10 Dec-14 Dec 2010. Distance Point A to Point B is approx 2400 miles. 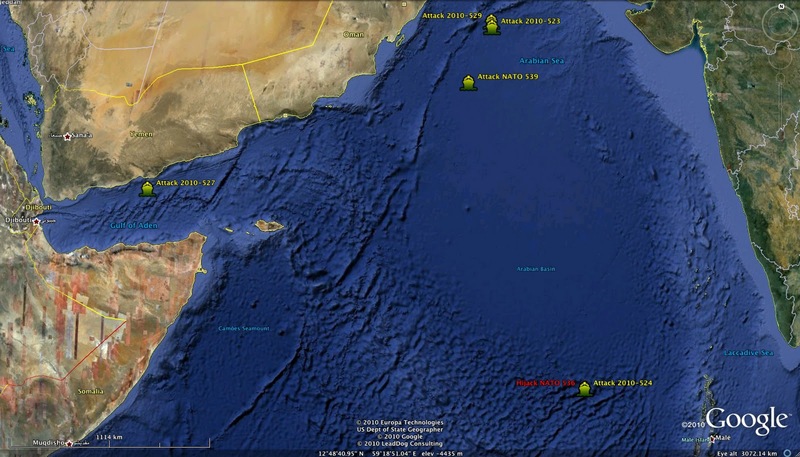 Attack farthest east of Somali took place about 1000 miles off Somalia. Description: GULF OF ADEN: Merchant vessel attacked in 13-09N 048-29E at 131000Z Dec. Vessels are advised to keep 100 miles clear of this position and to exercise extreme caution. Description: WESTERN INDIAN OCEAN: Pirate activity in 13-14.8S 054-43.0E on 13 Dec. The area involved should be avoided if possible. This area will remain high risk for at least 24-48 hours. Caution advised. 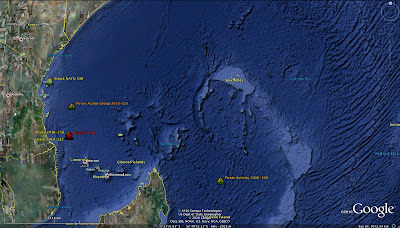 Description: WESTERN INDIAN OCEAN: Piracy action group reported in 07-33S 042-05E at 111030Z Dec. Vessels passing within 100 miles are advised to exercise extreme caution. 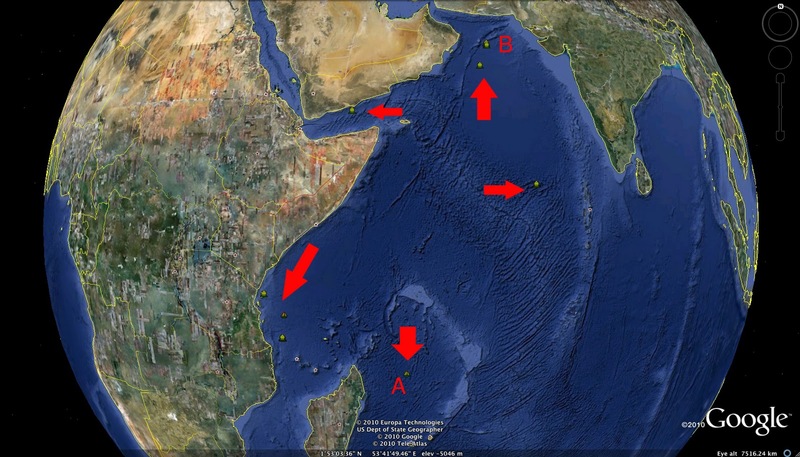 Description: SOUTHERN ARABIAN SEA: Merchant vessel attacked in 06-11N 067-25E at 110542Z Dec. Vessels passing within 100 miles are advised to exercise extreme caution. Description: ARABIAN SEA: Merchant vessel attacked in 20-51N 062-46E at 101504Z Dec. Vessels are advised to keep 100 miles clear of this position and to exercise extreme caution. 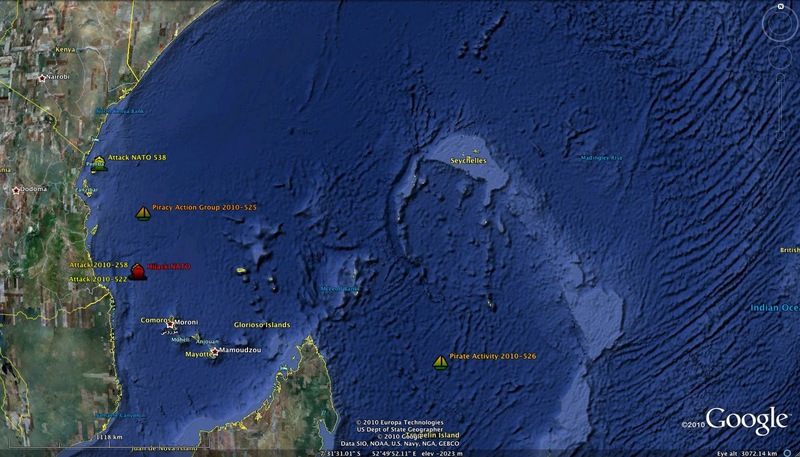 Description: WESTERN INDIAN OCEAN: Merchant vessel attacked in 09-57S 041-46E at 101212Z Dec. Vessels are advised to keep 100 miles clear of this position and to exercise extreme caution. Description: INDIAN OCEAN: A merchant vessel noted being attacked by two skiffs at 1233Z on 10 Dec in position 09-56S 041-48E, approximately 123 miles northeast of Comoros. This area will remain high risk for the next 24-48 hours. Description: ARABIAN SEA: A merchant vessel noted being attacked by two skifffs at 1550Z on 10 Dec in position 21-05N 062-44E approximately 200 miles southeast of Sur, Oman. This area will remain high risk for the next 24-48 hours. Alert Details: Alert number 540 / 2010. At 0215 UTC a merchant vessel was reported under attack by 2 skiffs in position 1207N 06026E. 4 POB in skiffs. RPG and machine guns sighted. Alert number 539 / 2010. At 0756 UTC 14 DEC 10 a merchant vessel was reported under attack by 2 skiffs in position 18 27N 061 50E. Mothership was reported nearby. 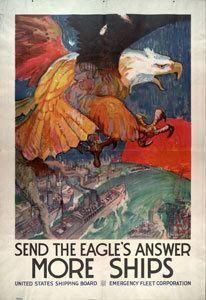 The vessel was fired upon by RPGs. At 2200 UTC / 13 DEC 10 / a merchant vessel was reported under attack by 2 x skiffs in position 05 28 S 039 58 E.
2 x speedboats were used. Shots were fired upon the vessel. Alert number 537 / 2010. At 1000 UTC a merchant vessel was reported under attack by 1 armed skiff in position 1309 N 04829 E.
Reference previous Alert number 534/ 2010. 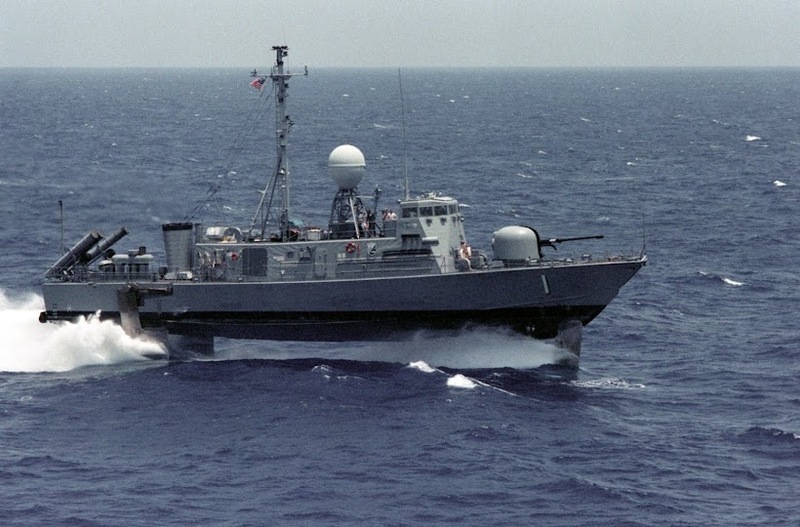 At 0542 UTC / 11 DEC 10 /a merchant vessel was reported under attack by pirates in position 06 11 N 067 25 E.
At 1030UTC / 11 DEC 10 / a Pirate Action Group consisting of pirated FV was reported in position 07 33 S 042 05 E.
At 0542UTC / 11 DEC 10 / a merchant vessel is currently under attack by pirates in position 06°11 N 067°25 E.
1 skiff with 4POB, small arms and RPG. Mother ship in vicinity of pos 3NM. Alert number 533 / 2010. 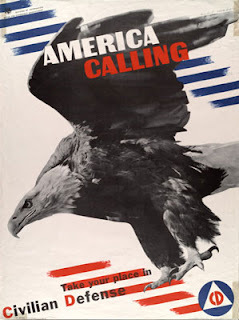 Reference previous Alert number 532 / 2010. At 101504 UTC a merchant vessel was reported under attack by pirates in position 2051N 06246E. At 1504 UTC / 10 DEC 10 / a merchant vessel is currently under attack by pirates in position 20°51 N 062°46 E.
Alert number 531 / 2010. Reference previous Alert number 530 / 2010. At 101212 UTC a merchant vessel was reported under attack by skiffs in position 0957S 04146E. Alert number 530 / 2010. According to Turkish Undersecretariat for Maritime Affairs, the hijacked Taiwanese fishing boat TAI YUAN is being used as mother ship and has been renamed as MALAYSIA 618. UMA also reports that hijaked M/V POLAR and M/V HANNIBAL II are underway and may be used as mother ships. can you explain why the latest pirate attack appears to have "occurred" in 2019 ? so it was Dec 2010 i presume...?